Fulton County Fair Grandstand Diner Chair Ed Miller, center, presented checks dividing the diner’s proceeds of $7,366 to Jim King, left, and Paul Colon, right, for the FISH food distribution programs in Archbold and Wauseon, respectively. Miller extended a warm thank-you to fairgoers who supported this year’s diner. 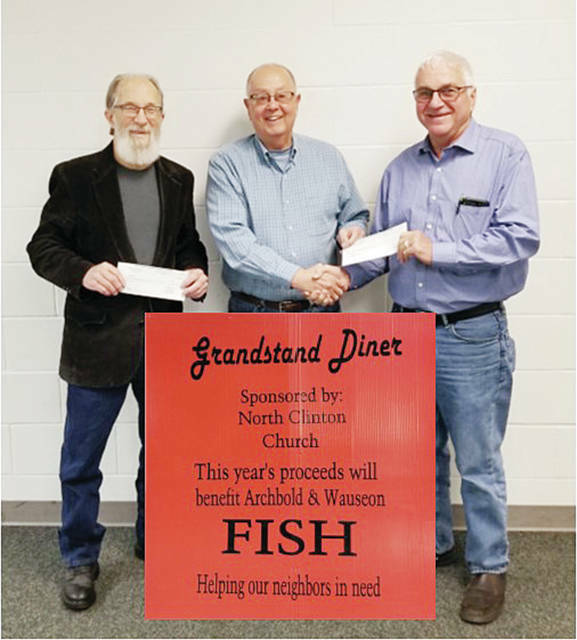 https://www.fcnews.org/wp-content/uploads/sites/45/2018/11/web1_diner-proceeds-to-FISH.jpgFulton County Fair Grandstand Diner Chair Ed Miller, center, presented checks dividing the diner’s proceeds of $7,366 to Jim King, left, and Paul Colon, right, for the FISH food distribution programs in Archbold and Wauseon, respectively. Miller extended a warm thank-you to fairgoers who supported this year’s diner.